Please refer to our stock # 1834 when inquiring. 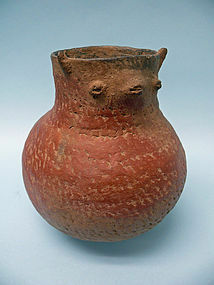 Rare Roosevelt Red Ware Pottery Duck Effigy Jar. With pointed ears, detailed eyes and beak, globular body with feather-like markings. 8" long, excellent condition. Ca. 1150-1400. Ex. Helen Andrews collection, Albuquerque, NM, acquired from Jack Taylor collection, Prescott, AZ. For similar item,see p. 49 Peckham, Stewart. From This Earth (Santa Fe University of New Mexico Press, 1990). Roosevelt Red Ware, also known as Salado Red Ware and Salado Polychrome, is a late prehistoric pottery tradition found across large portions of Arizona and New Mexico. The tradition involves the combination of red, white, and black paint in varying configurations along with compositional and morphological characteristics. This ceramic tradition begins about AD 1280-1290 and lasts until at least AD 1450 based on tree-ring dating.